Before John Romero co-created Doom he was just a kid. A very smart kid. 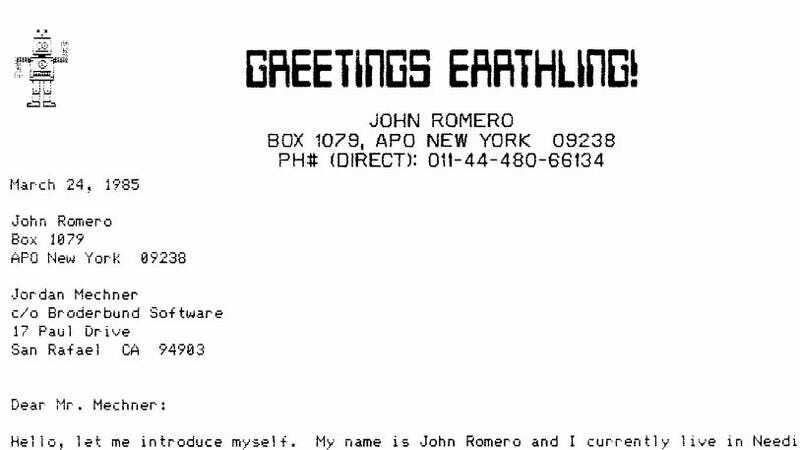 When he was a teenager, he wrote a letter to Jordan Mechner, a very smart man who made a game young John Romero liked very much. Romero had taste, because Mechner's Karateka was awesome, as was his later invention, Prince of Persia. On Wednesday, March 7, Romero and Mechner will join Markus "Notch" Persson (he merely made Minecraft), Tim Sweeney (founder of a neat company called Epic Games), Adam Saltsman (thank him for Canabalt) and USC's Jane Pickard (gaming reporter-turned-developer-turned academic) for one of the most star-studded panels the Game Developer's Conference has ever had. They'll be talking about the resurgence of indie development. And maybe Mechner will spill more on his new Karateka game. It'll be cool no matter what happens. Apple Classic Karateka Gets Reboot, Bird Punching Makes a Comeback! It&apos;s pronounced "cara-take-a." And the hit Apple II game is coming back this year. And now, thanks to this letter Mechner is sharing with us, we can see how two of the gaming industry's titans made first contact. John Romero, you were a hell of a 17-year-old. That's for sure.